To put it simply, a sweatshop is commonly a factory that takes advantages of its workers, using them to produce products that will make exponentially more profit than their cost. In the market today, we have heard about sweatshops in everything from the consumer electronics world to the coffee and cocoa industry. But did you know that sweatshops are most widely reported in manufacturing clothing and cotton? People who work in sweatshops live in impoverished areas, where finding any type of paying job can be extremely rare. Because of this, sweatshop employees are often forced to purchase housing from employers at higher rates than what they would otherwise pay, buy goods from a company store run by their employers, and spend nearly everything they have on food because their wages are so low. In other words, sweatshop employees are modern day slaves – living, eating, and breathing at their employer’s beck and call. The worst part? Sweatshops have been found in Asian countries like China and India, nations like Indonesia, areas of Central and South America, and even right here in the United States. At BELLA+CANVAS, we do things differently. Every one of our styles that are produced overseas are fair trade (we’re also always in contact with these factories to ensure they’re following our ethical policies), and we produce over 10 million garments each year in the United States. We are WRAP Certified (Worldwide Responsible Accredited Production), which means we treat every one of our employees with dignity and respect, and are constantly aware of our environmental impact. A tough accreditation to receive, WRAP certifies its suppliers based on twelve principles which range from health and safety to environment to the prohibition of forced labor. We’ve received a platinum certification, the highest level possible! In addition to ensuring our employees are treated ethically, we aim to do the same for the environment. While many companies produce enough waste to fill several swimming pools daily (we couldn’t live with ourselves if we knew our warehouse created trash hauls like that! ), our sewing floor creates almost no landfill, so everything we can’t turn into a tee is either recycled or repurposed. We also power our sewing floor and headquarters with solar energy generated from solar panels on our roof and provide electric car charging stations to encourage our employees to live as green as possible! There will always be unethical clothing manufactures and consumers who choose to turn a blind eye to this issue, but we like to think that there are people who care about the process behind their purchase. Are you a person who cares? We thought so. 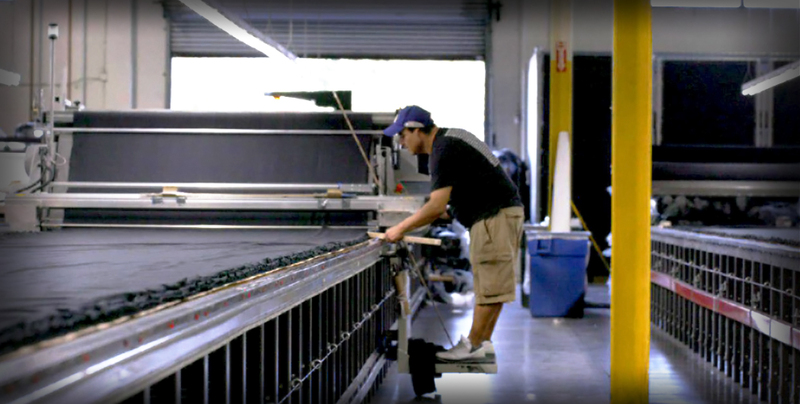 Learn more about our textile production, printing facilities, and more by clicking here. We are more than happy to show you how we’ve ensured that we will never fall back upon sweatshop labor or goods.